On January 31, 2018, the Florida Senate voted to replace Confederate Gen. Edmund Kirby Smith with educator Mary McLeod Bethune in the United States Capitol. Smith’s removal is certain. The Alachua County (Florida) Public School District has also stripped Smith’s name from their administrative building, formerly Kirby Smith Elementary School. Since the Senate vote was unanimous, we can assume the substitution of Bethune in the Capitol will be made. Probably you already know about Bethune. Ironically, she already has a statue in Washington, D.C., just twelve blocks east of the Capitol in Lincoln Park. In this essay, I want briefly to suggest that Smith should never have been honored. His selection disgraced Florida and speaks volumes about the sorry state of race relations in the United States in 1922. From January, 1863, to war’s end, Edmund Kirby Smith was in charge of all Confederate forces west of the Mississippi River. After taking Vicksburg, Mississippi, on July 4, 1863, and Port Hudson, Louisiana, five days later, the United States controlled the river. After that, Smith operated largely on his own. His forces comprised the national Confederate government in the trans-Mississippi. What Smith did or approved amounted to Confederate policy in Texas, Arkansas, the parts of Louisiana under Confederate control, and most of Indian Territory, now Oklahoma. Smith did not set pretty policy. What exactly had Smith told Taylor to do? “Giving no quarter” means killing all black POWs at once. This is of course a war crime. POWs by definition are no longer enemy combatants and are not to be murdered. There are reasons for this policy, not least the fact that soldiers know they might not always be victorious and do not want to be murdered if captured in a future battle. Even Hitler’s forces did not kill black or Jewish soldiers when they captured them during World War II. “If they are taken, however,” Smith went on, they are to be turned over to civilian authorities “to be tried for crimes against the State.” Another letter, this one by S.S. Anderson, Assistant Adjutant-General to Smith, makes clear that this policy amounts to a sure death sentence. However, it carries a veneer of law. This was important, because the United States was insisting that all its soldiers be treated alike, regardless of race. “Should negroes thus taken be executed by the military authorities capturing them it would certainly provoke retaliation,” Anderson noted. Indeed, General U.S. Grant, commander of the Vicksburg campaign of which this battle was a part, as well as his boss, President Lincoln, threatened to execute Confederate POWs if the Confederacy continued to execute black POWs. Having civilians do this work, however, would guarantee that “no exceptions can be taken,” Anderson wrote. That penalty was of course death. Later Confederate war crimes, such as the murder of black POWs after the Battle of Poison Springs in Arkansas and the Fort Pillow massacre in West Tennessee, were in keeping with this tradition established by Smith and Davis. 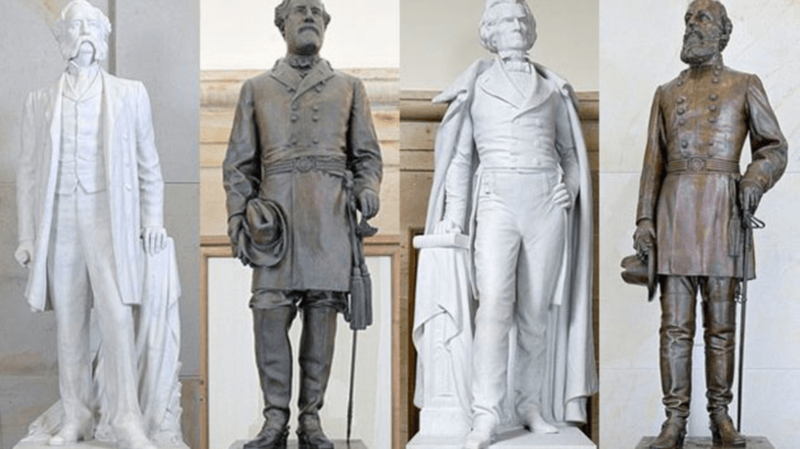 After Smith comes down, the rest of the Confederates in the Capitol should go, too. 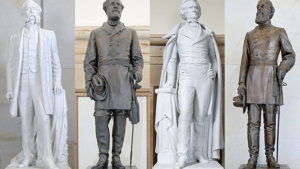 They include Mississippi’s James Z. George; Wade Hampton of South Carolina; Alexander Stephens of Georgia, Vice-President of the Confederacy; and the arch conspirator of them all, war criminal Jefferson Davis of Mississippi. Perhaps a case can be made for Alabama’s Joseph Wheeler and North Carolina’s Zebulon Vance. That would depend upon whether they were chosen because of or despite their Confederate credentials. But South Carolina cannot rehabilitate John C. Calhoun, the theorist justifying slavery and secession. His bust needs to find another resting place, one that does not intrinsically connote honor and praise. 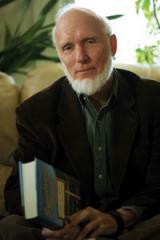 See Brendan Farrington, “Fla. Moves to Replace Confederate Statue in US Capitol,” AP, 1/31/2018. All quotations by or about Smith and Davis are from Loewen and Sebesta, The Confederate and Neo-Confederate Reader, with Edward H. Sebesta, co-editor (Jackson: Univ. Press of Mississippi, 2010), 198-205.